Ferry services operate from the UK and France and regular coach and train services operate from Dublin and Cork to Limerick daily. JJ Kavanagh & Sons provides a service between Shannon Airport and 3 stops in Limerick: Arthurs Quay in the City Centre, outside the main gate of the university (Flagpoles of UL) or into the university (main campus bus stop). Tel: +353 (0)56 8831106. For a detailed timetable log onto www.jjkavanagh.ie, select Route "Shannon Airport - Limerick - Nenagh - Portlaoise - Kildare - Dublin City - Dublin Airport" timetable. 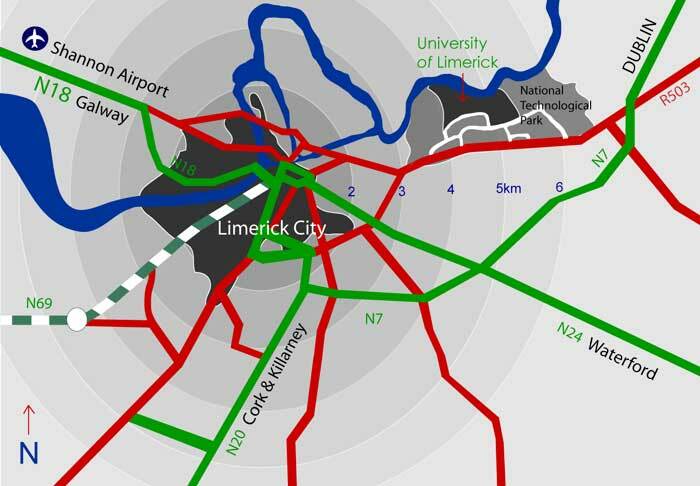 If you decide to rent a car from the airport the best route to get to Limerick by road can be found by logging onto this route planner.